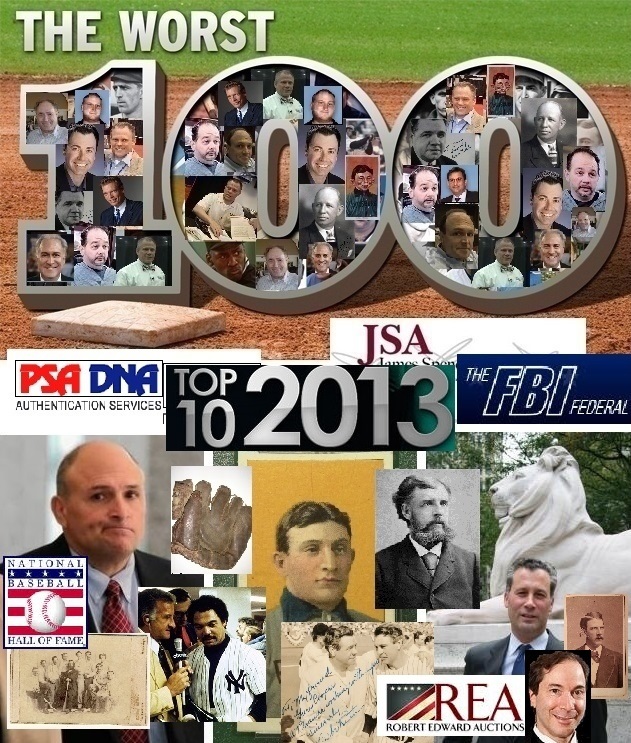 2013's Top 10 Stories include the Bill Mastro guilty plea; PSA & JSA's Worst 100; and the NYPL & FBI give-aways of stolen artifacts. Guilty pleas, institutional negligence and authentication malfeasance filled the headlines for 2013 and helped increase Hauls of Shame’s readership to record highs since our inception in 2010. By the time the year is up we’ll have had over 1.5 million page views by over 600,000 unique users. Thanks to the TPA’s, Bill Mastro, the trimmed T206 Honus Wagner and the stolen treasures from the NYPLs famous Spalding Collection, the headlines of 2013 provided compelling reading material for hobby aficionados and baseball history buffs alike. Some of the stories infiltrated the mainstream media while others were useful for collectors trying to avoid getting ripped off online or on the auction house floor. Some of the stories even inspired threatening cease and desist notices from shyster lawyers like REA’s Barry Kozyra trying to shield clients from further ridicule and exposure. While the baseball artifact trade remains a mine-field of fraud and deception, collectors were at least afforded the opportunity to see for themselves the exposure of forgeries and the identifications of artifacts wrongfully removed from institutions. Hopefully, the investigative reporting on this site was a welcome alternative to other hobby outlets that simply regurgitate press releases issued by their advertisers and provide cover for the usual suspects and hobby fraudsters. 2013 was business as usual for the hobby PR-machines as Joe Orlando and PSA opened themselves up to further allegations of racketeering as they continued to solicit and post paid advertisements from the very same companies that they give preferential treatment to. Continued milquetoast reporting from hobby frauds like Rich Mueller and Rich Klein at Sports Collectors Daily illustrated how so-called hobby news outlets remain in the pocket of assorted hobby power brokers. Klein published the most embarrassing post of the year when he interviewed Joe Orlando and tossed soft-balls at him asking about his college baseball career and the “fun and interesting people he’s dealt with.” Klein decided not to ask Orlando about all of the indicted people he’s worked with; the Mastro trim-job on the PSA-8 Wagner or the rumors he’s the target of an FBI probe. Klein and Sports Collectors Daily win our “Sycophants of the Year” honors, hands down (or hands out). Fortunately, a large cross section of the hobby has sought out the coverage on this site which is free from the incestuous relationships between the auctioneers, authenticators and PR flacks that control the delivery of hobby news. Our year-end list of the top 10 stories was determined by you, the readers, who have flocked to Hauls of Shame for their hobby news over the past twelve months. Thank you for your continued support. PSA/DNA and JSA have made some stunning mistakes in recent history and our expose listed and illustrated the top 100 blunders made by so-called experts like Jimmy Spence and Steve Grad in great detail. The evidence suggests that Grad and Spence, who both got their start at the company founded on a fraud, are unqualified to authenticate autographs. Included in the “Worst 100″ were the infamous Sal Bando and Mike Schmidt videos and the exposure of authentication malpractice related to authentications of signatures attributed to A G Spalding, Jimmy Collins, Mickey Welch, Dan Brouthers, Cap Anson, P T Barnum, Jesse Burkett, Rocky Marciano and even Cheetah the Chimp. The response from our readers was overwhelming and the report easily surpassed all others to become the most popular story of 2013 . 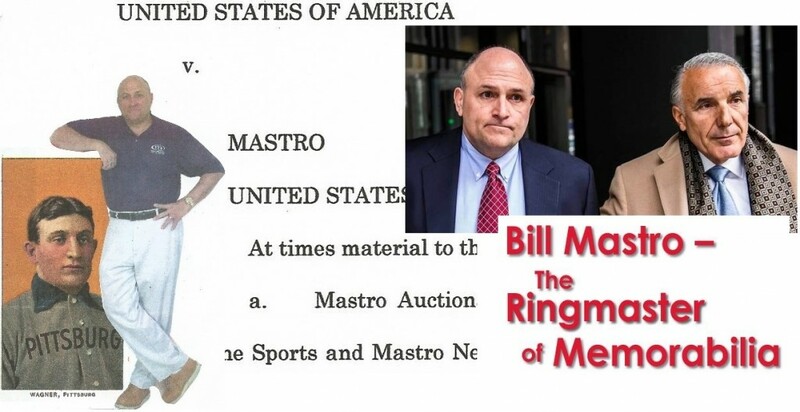 As a result of an FBI investigation that lasted several years, former Mastro Auctions founder Bill Mastro plead guilty in Federal court in Chicago to one count of mail fraud but he also admitted to trimming the famous PSA-8 T206 Honus Wagner card before he sold it to Jim Copeland for $120,000 in 1987. The story was included in our on-going 10-part investigative series dedicated to the Mastro case and the trimmed T206 Wagner. Read the full story published in October here. After four years of the FBI investigating the theft of Harry Wright’s papers from the NYPL’s famous Spalding Collection in the 1970’s, the stolen papers seized after being identified in MLB’s All-Star FanFest Auction in 2009 were returned to the consignor and then sold to a collector. All of this despite the fact that many of the documents were cited and sourced specifically to the NYPL collection in scholarly works and notes written by Dr. Harold Seymour and Dorothy Seymour Mills. The New York Post also covered the story but our report went into much greater detail. 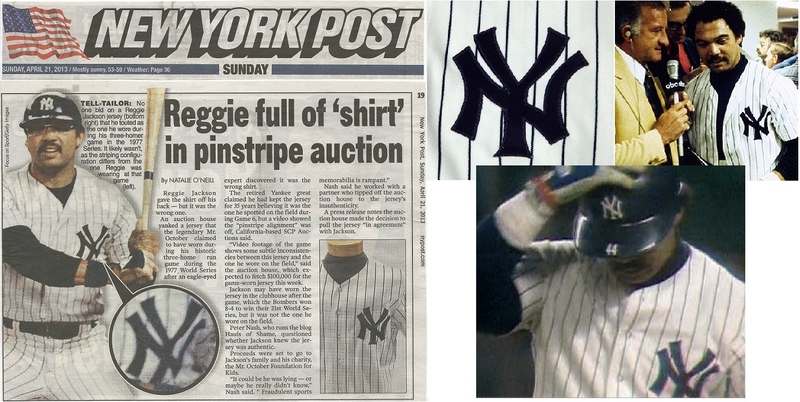 Reggie Jackson consigned the million-dollar jersey to SCP Auctions claiming it was the same one he wore when he hit three home runs in game 6 of the 1977 World Series, but examination of the uniform pinstripes by experts proved that it wasn’t the same one worn in that famous game that made Jackson “Mr. October.” Our report was also picked up by the New York Post in their own report of the Reggie controversy. 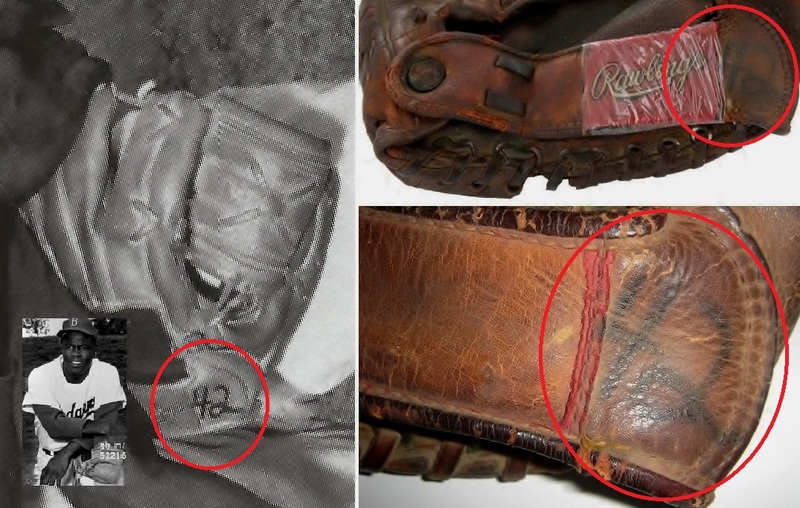 The memorabilia company ventured into the vintage market offering a glove they claimed was worn by Jackie Robinson in the 1955 and 1956 World Series and that the glove was also “known to be his last game-used glove he ever wore.” Steiner appeared on TV shows claiming that the company had definitive ‘photo matches” of Robinson wearing the very same glove during that time period. Smoking gun evidence exposing the thefts of rare artifacts from the Baseball Hall of Fame was discovered via SABR contact sheets from a 1983 photo shoot and donation documents found in National Baseball Library files. A rare 1870 CDV of the Philadelphia Athletics was identified as Hall of Fame property but also as a lot in a 2013 Legendary auctions sale while several rare payroll receipts from the New York Giant team including rarities like Buck Ewing and Mickey Welch appeared in 1990s auctions despite the fact they were sent to the Hall as a donation by New York Daily News sports writer Red Foley in 1973. To add to the Hall of Fame’s problems auctioneer Huggins & Scott offered material stolen from the Hall on a regular basis in 2013 including artifacts from the Frederick Long Collection and the Hall’s own internal files. All of these items (and more) were also included on the 2013 Hall of Fame Hot 100 List of items stolen from Cooperstown. A rare CDV/cricket ticket of Harry Wright owned by ESPN’s Keith Olbermann was withdrawn from Robert Edward Auctions’ Spring 2013 sale after Hauls of Shame published one report illustrating the dubious provenance of the card and another tracing the CDV back to Mike Gutierrez who claimed to have purchased the card at a Butterfield & Butterfield auction in 1990 as part of an alleged “Wright family photo album.” The photo album was sold with no provenance information and appeared to have originated from HOFer George Wright’s collection which was donated to Cooperstown by his son in the 1940s. Since the late 1980’s Gutierrez has been the prime suspect in investigations into the Hall of Fame thefts. Gutierrez was also working for Butterfield & Butterfield when he purchased the Harry Wright card as partners with dealer Lew Lipset. When the CDV, described as the “first baseball card”, was withdrawn from REA’s sale, auctioneer Rob Lifson said it was at the request of his consignor, Keith Olbermann. Heritage’s Platinum Night auction in New York City featured the sale of Curt Schilling’s famous bloody sock from 2004 but was marred by the exposure of several fake and suspected fake items appearing for sale alongside it. One of the items was a ball they claimed was from the last out of the 1917 World Series, but an article published by Hauls of Shame proved that the ball was actually manufactured in 1926. 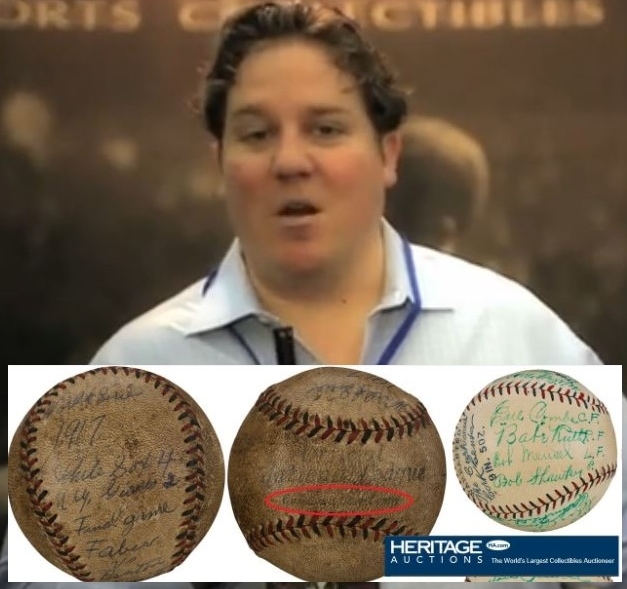 Heritage and Chris Ivy pulled the 1917 ball from the sale along with a suspect Lou Gehrig single-signed ball but chose to sell several other alleged fake items including a 1927 Yankee signed team-ball for over $149,000; a 1932 signed Yankee team photo for over $33,000; a Home Run record ball signed by Mark McGwire for $8,962; a Babe Ruth signed B&W HOF plaque postcard for $22,000; and several other highly suspect items. Keep on the look-out for more investigative reporting from Hauls of Shame in 2014. Keep up the great work! Looking forward to your articles in 2014. Pete great stuff glad someone is trying to clean up the hobby!!! Look forward to 2014 and more fakes and so called experts exposed !!!!! Keep it up!!! Somebody told me that the jaguar pajamagrams I bought for my wife are actually leopard print. How about that? The truth always comes out in the end and the poor souls who paid big $$$ ,s for worthless junk are the ones who suffer in the end,oh well, live and learn.Lets hope 2014 will prove to be a better year for memorabilia !!!!!! Herbie, the people who have been written up on this website are all still out there except for Mastro. The hobby won’t have a better year in 2014 :(. Rich, lets hope by people learning more about these idiots, they will be more alert as to what they are buying etc.and eventually these idiots will be put out of business. How many snow white babe ruth signed baseballs around in the hobby 25 years ago or longer? very few. how many now? more than we can count and more surfacing every year! They were all stored in a sock in the closet or the dresser drawer i guess that’s how the story goes. It’s unbelievable. when are we going to stop believing these ’stories’? These baseballs survive ’snow white’ from 80 plus years ago but most baseballs signed by mickey mantle, joe dimaggio and ted williams from the last 25 years during the memorabilia boom have discoloration and those had people investing in those balls who took care of them and made sure they weren’t played with or just thrown in a corner somewhere. while the babe ruth balls look like they were signed yesterday with no fading. Travis,you hit the nail right on the head,THEY WERE SIGNED YESTERDAY and it has been proven stone cold forgeries and that is the said part of it all $ 15,000.00 for a $ 15.00 ball. Travis, there’s ample evidence that many of these these balls are indeed “authentic” – but have IMO been “washed”, just the way old documents have been bleached in order to remove foxing, stains, etc. It’s a known process and has been used with paper for a very long time. Of course, traces are left on the paper, and I’m sure that some of these baseballs would show residue as well. It’s just a matter of time before this blows up. This photograph surfaced in the hobby in the 1990s and was sold by Mastro Auctions for over $20,000 with an LOA from PSA/DNA. 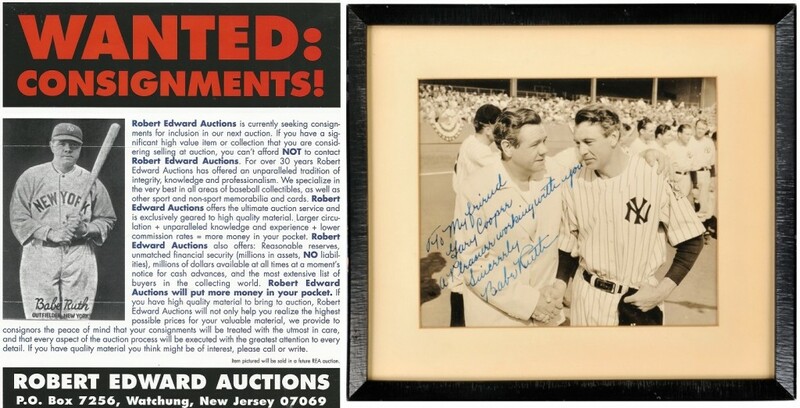 More recently it was identified as a forgery in author Ron Keurajian’s book, Baseball Hall of Fame Autographs: A Reference Guide and also appeared for sale at Robert Edward Auctions in May of 2013. Despite knowledge of Keurajian’s opinion and additional testimony from Gary Cooper’s daughter stating her family collection never included such an item, REA sold the forgery anyway.